Invisible letters and glyphs are a great fantasy trope and can make for really interesting and engaging props in your game. In your world, the letters or symbols could be drawn in Mithril ink that is only visible by moonlight, arcane magic that is triggered by word or touch, or simply disappearing ink that’s exposed by heat or chemical reaction. It could be a map, a secret door, a spell, or coded instructions from the king. Invisible ink markers seem to be hard to come by these days, but I was able to find a company online that sells them. Unless you have a black light at home already, you’ll also need something like this mini black light keychain to reveal the ink. Other than that, all you need is some paper (see tips below). Draw up an invisible map or letter, hand it out to the players at the appropriate time, and watch them puzzle over this mysterious prop. Don’t give them the light, of course, until they’ve determined how (in game) to make the letters appear. Use clean, bright white paper, for best results. If you use colored paper the ink may not blend in completely. Paper that comes with a pattern already printed on it (e.g. a scroll pattern) seem to work okay, but your mileage may vary. It may not work well over printer ink (if you prink out your own scroll texture, for instance). The hidden letters are easier to see under blacklight when the room isn’t brightly lit. A good excuse to turn down the room lights for atmosphere. Consider hiding the secret message on a page with other words or symbols drawn on it, like at the end of a handwritten letter, or on a map. A handout with words or drawings on it is much less likely to arouse the suspicions of your players than one that appears to be completely blank (of course, if you want them to be suspicious, then go right ahead and do so). DMs that make their own 3D terrain can even use the markers on them to draw hidden doors, runes, or other magical features. The ink dries clear on craft paint just as it does on paper. I wouldn’t recommend drawing on your vinyl battlemaps with an invisible ink pen as it’s unlikely to come off. It should, however, work on Gaming Paper. Props can go a long way toward adding realism and enhancing the atmosphere of your game. I am a big fan of props and try to incorporate them whenever possible. Here’s one I’ve gotten to use recently: The Echo Mic. 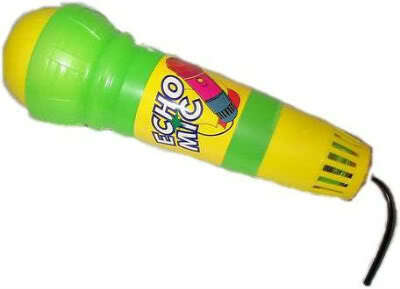 The Echo Mic is just a simple plastic tube shaped like a microphone housing a spring or coil of metal. When you talk into it, it adds a metallic echo to your voice. You won’t win any Oscars for Sound Design with this thing, but its cheap and relatively effective (mileage may vary depending on the quality of your voice acting). The Echo Microphone is most useful for creating ghostly, eerie, or otherworldly voices. The cries of the undead, the distant moans of zombies, the voices of ethereal beings, etc., are all good candidates, enhancing the atmosphere of a room or encounter or giving weight to an important NPC. As an example, I recently used it to help roleplay the character of Sir Keegan in Keep On The Shadowfell, emphasizing his ghostly dialog. It can also be used to create unusual sound effects by tapping the sides or rapping it on a table. You can find his prop for just a few bucks at a party store, toy store, or online retailer.